October has been a very complicated month. The storm that hit Urukundo on September 30 rocked our world. Thanks to many of you and your quick response, we were able to replace roofs and clean up the internal damage. I am thankful no animals were lost and the children were out of harm’s way when the storm did its worst to destroy our farm. We are back on our feet and moving on. Let’s start out with a little humor. My latest purchase. Didn’t cost much but made me laugh. Now and then I need to laugh. Hope he makes you smile. The kids named the picture LENNART. Lennart comes from Germany brings his guitar and sings for the kids. They love you Lennart. Lennart hangs on the wall in Mama’s house. Always ready to brighten my day and make me smile. Our school for sewing is expanding. 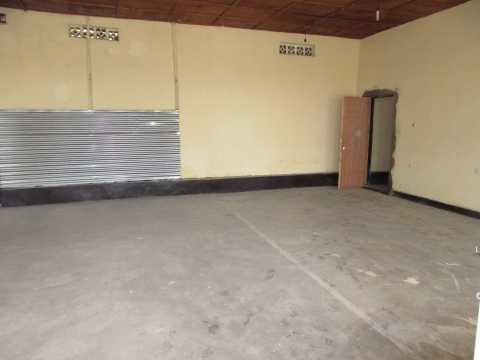 It was one crowed room with little space to work and no special area for teaching a class. Our number of students, our orders for uniforms, bags, aprons, etc. has increased. We needed more working space. Students at Sewing Center. Thresea trying to teach with no classroom. In the new classroom, we will also have a knitting machine to make and sell school sweaters. We now have 3 rooms and a shop for displaying our product. Larger room for teaching. Sewing Machines will soon be in this room. Luki, Kinela, Kenny; our kids and Uwera a student at our school. Our Johnny (in sweater) wins an award for being THE BEST Reader in the first grade out of 70 in a competition sponsored by Urukundo Learning Center and Library. We are very proud of Johnny. 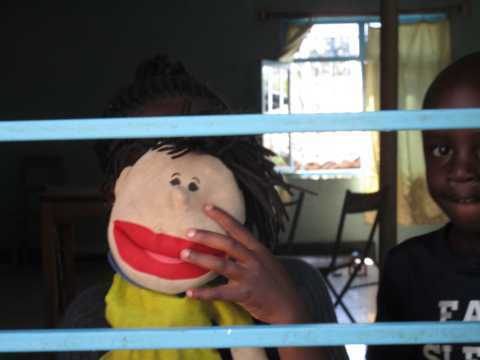 Puppet show at Hope House. Kaboss and Rebekah presenters and using imagination. Living by faith can be a bit shaky but at Urukundo that is a way of life. Toilets for Primary 4, 5, & 6 students was a priority so we went ahead on faith with clearing, leveling, digging the hole for septic, praying funding would arrive. We are blessed. Funds have arrived. Urukundo Learning Center is so grateful to World Orphan Fund (check out their web site) a wonderful foundation who believes with us that education is the tool for a better future. 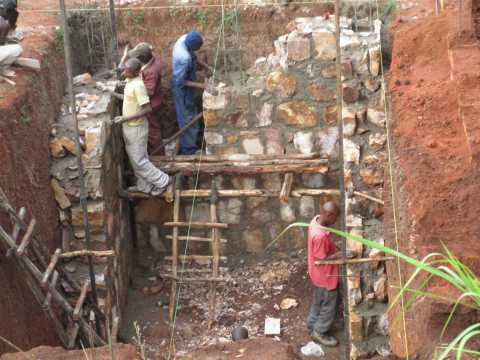 They visited Urukundo Learning Center and designated a gift to make building the facility for the Primary School possible. Thank you WOF. 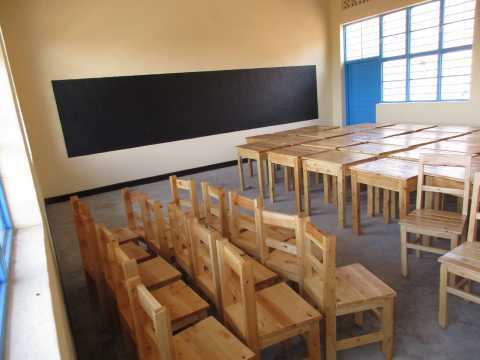 Thanks to AIC (Africa International Club), we have desks and chairs for the opening of Primary 4 in January, 2016. Inside Primary 4 class room. 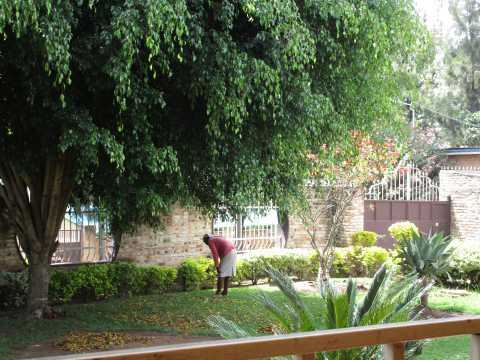 At the homes and guest house. I remember raking leaves in the fall months after the beautiful color display at my home in Williamsport, Pennsylvania. I thought it was hard work. 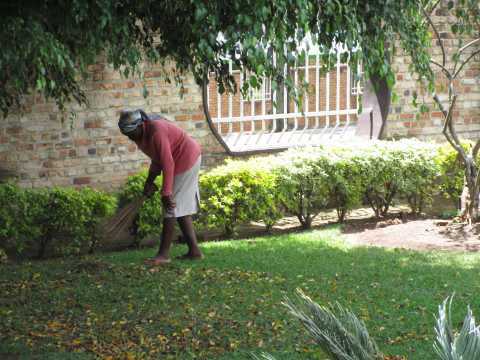 Raking leaves in Urukundo Rwanda. More like sweeping leaves. Doing our part to serve others. Our children pray god will teach them sharing. That is what we do and you help by your gifts. Your gifts to UHFC through Hope Made Real are far reaching. The scope of what you do with a donation to HMR has reached a new dimension. Included are Community children, newborn babies, needy mothers, refugees in camps, people in need of Dental care, and Our kids at Urukundo. Urukundo Foundation shares clothes for adults, children and blankets with refugees in the Camp near by. Working with Gabriel Habimana from Social affairs at the District Level, we are able to contribute to the welfare of those less fortunate and in need. Your gifts of clothes, blankets, shoes, etc. are appreciated, not just by Urukundo and our children but by Rwanda as our country becomes a Safe Haven for desperate people. 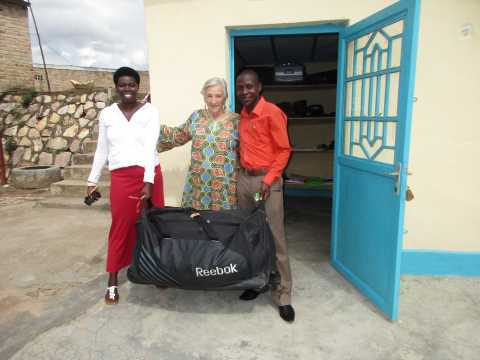 Large duffel bag packed full of clothes & blankets for refugees in the camp in Muhanga district. Doing our part as members of the community of Muhanga. 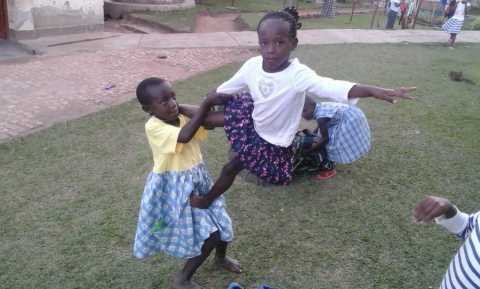 School children benefit from your clothing gifts to Urukundo Home for Children. Rwanda’s Mamas care about their children. We can and do help. 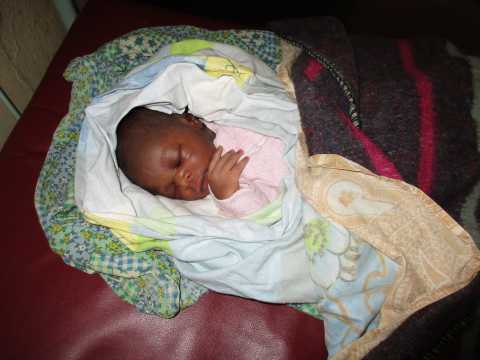 In the first 3 weeks, Mama and Baby project has provided clothing for 15 newborn babies and more than 30 hats to the delivery center for added warmth for little heads. Keep the hats and clothing coming please! Mamas are grateful. Twins receive needs. Their mama is happy. 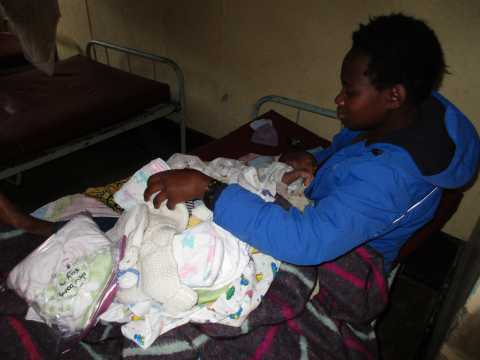 New young mother in need receives a packet of clothes for her baby. This is an awesome ministry. Help where help is most needed. Grateful mama, nurse inspects the gift. God’s gift. A child is born. Our Baby and Mama program keeps growing. There are too many to put pictures of every one. We will keep a count and update each month and will choose a picture or two to keep all posted. Your gifts are making the difference. Abigail from New Zealand came home for her second visit. Abigail teaches CIRCUS. Yep, that is her profession and the kids love her and acrobatics she shares with them. She also cooks Chinese food for the kids each time she comes. 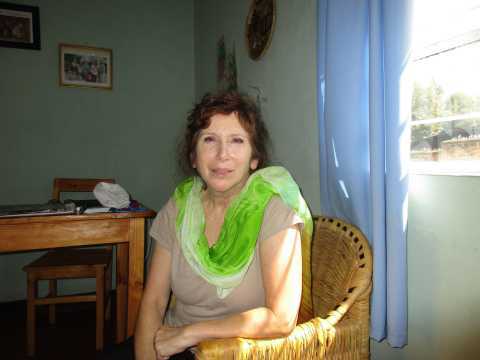 Shelia an anesthesiologist from Washington State paid Urukundo a visit on October 4, 2015. Her mission was to deliver a package for our young man John Paul. After being here and meeting the children and touring she has determined to return in 2016 when she returns to work at a Rwanda hospital. We will be delighted to welcome her. Go ED. Africa Consulting Ltd. has returned for the second year. We are pleased to be connected to such a fine organization. 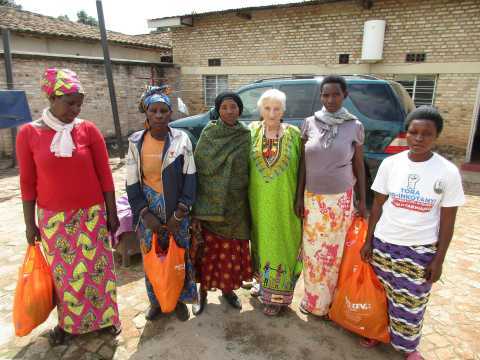 Last year (2014), Abby & Sara did their Practicum while attending University in Rwanda at Urukundo Village. Here in 2015, Anne, Jillian, Olivia, and Anna; four special young women are serving their Practicum at Urukundo Foundation. Olivia music and dance time. 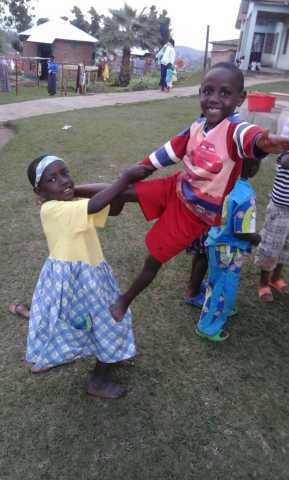 Ann with Teacher David at play time with the kids. Anne & Olivia bringing Cow Grass to the cows. Go-Ed kids are so welcome at Urukundo. This young woman is part of our Urukundo Family. When I told the kids, we would have a visitor and that visitor was Meredith. One of the boys spoke up and said, “Mom, she is not a visitor, she is family.” Meredith, that makes it official. Meredith has been family since 2009.